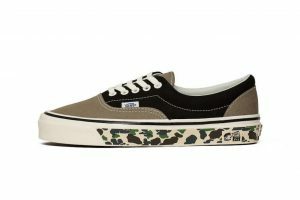 Vans just announced a new UA Anaheim Factory Era 95 DX in a new “Camo Tape” colorway as they continue to pay tribute their first factory. This iteration features a mix of brown and black on its canvas upper. Setting this apart from their typical version, this one has a split sole unit graphic which sees both camo print and the original checkerboard design divided between both sides. The classic “OFF THE WALL” red license plate sits comfortably on the heel tab, while “Series 13” is found as lateral side sole graphic. This is all rounded out nicely with cream laces, a bold black wall stripe, and a contrasting white and blue tag. In other related Vans news, check out their new Thermochrome Pack.